Teaching English in Costa Rica is a lot of fun! I teach in-company Business English classes in San Jose, where many international businesses have their Latin America offices. They hire an ‘instituto’ to create the curriculum and send certified teachers. I am a freelance teacher and my employers send me all around San Jose to teach at various business parks. I prefer to teach Business English rather than children because the pay is better and I have flexible hours, so I have more money and time to travel in Costa Rica. In this blog, I’m going to share my experience and give you some teaching and traveling tips. The level of English in Costa Rica is very good, but companies want their employees to be more proficient in their communication skills. My job often involves role-playing phone conversations and helping students with presentations. The 120-hour TEFL certificate with Business specialization prepared me to use both the Communicative Approach and Task-based learning, which allowed me to integrate business specific tasks with grammar lessons. One of the things I love about teaching in San Jose, Costa Rica, is how close I am to paradise. 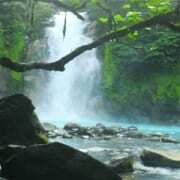 One weekend I can go surf in Playa Hermosa and the next hike the trails to the Rio Celeste waterfall. Other places I love to visit are Limon and Santa Teresa. If you can, I highly recommend visiting the thermal pools in La Fortuna de San Carlos. Most places are just 2 hours away, so you can teach English Monday to Friday and take an awesome weekend road trip. As I mentioned earlier, I chose to teach Business English because it provides me with very flexible hours, so sometimes I am able to take long weekends and enjoy myself more. The best time to come to Costa Rica is August! Get your TEFL certification and apply for jobs today! Where Can I Teach Abroad with a TESOL / TEFL Certificate?